I wrote yesterday about President George W. Bush being the biggest spending president since President Lyndon Johnson. I based this on information from the Cato Institute’s recent paper, The Grand Old Spending Party: How Republicans Became Big Spenders. Bush shares another characteristic with Johnson (and Carter): they increased both national defense and non-defense spending. Other presidents decreased one or the other. What’s striking is the steepness of increase for both spending categories under Bush. Instead of “let them eat cake” Bush is attempting to have his cake and eat it, too. Source: Office of Management and Budget, Historical Tables. Budget of the United States Government, Fiscal Year 2006, Table 8.2, p. 126. I don’t see meaningful associations, absent an analysis of PER CAPITA spending in 2000 dollars (and factoring the transition from the pre 70’s gold currency standard). What is the ratio of per capita deficit/surplus to per capita GDP? From population data, the U.S. population was around 200,000,000 in 1968 and is around 280,000,000 now, with a fairly linear change. Therfore, Bush’s numbers could be multiplied by about 70% to compare the per capita spending of Johnson and George W. Bush. Here is the chart shown above, with a linear correction factor applied. In any case, because both the defense and non-defense spending are measured similarly, the main point is still true. 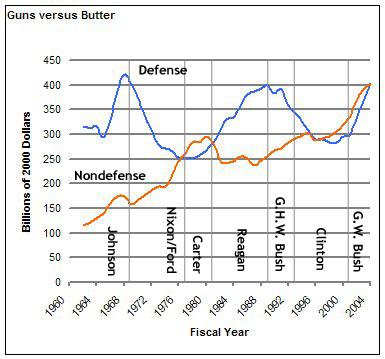 Bush is increasing spending dramatically on both guns and butter.